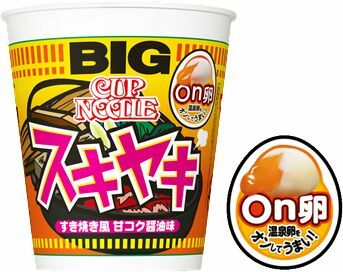 Nissin Cup Noodles: Sukiyaki in a Cup! Enjoy these tasty instant noodles in a delicious soy-sauce-based sukiyaki-style broth! The flavor of beef, soybeans, carrots and leeks all blend together for a taste treat that simply can’t be beat! *Available for purchase starting March 12th,2018. Sign up as a BuyandShip member today and get your items shipped to our JP warehouse, and we will have your cup noodles shipped to you in no time!